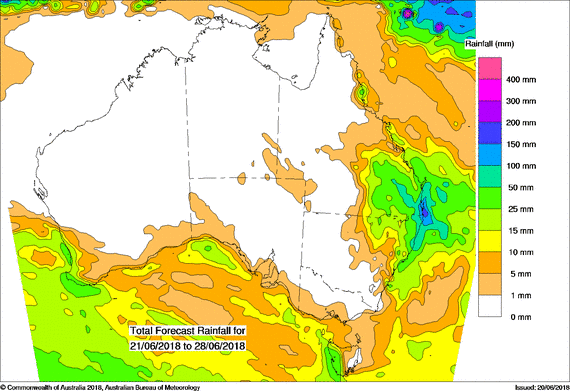 WIDESPREAD rain forecast for much of Queensland’s grain-producing areas has animal feeders hopeful of an easing in prices, but not seeing any downward movement yet. The Bureau of Meteorology says a large upper-level trough is developing over central Australia and will move into Queensland on Monday, delivering rain from central to southeast areas into Wednesday. Climate models suggest falls of 15-40 millimetres for most growing regions, which would be enough to boost prospects for planted crops, and prompt a late run on cereal and chickpea sowing. One source said trains were bringing grain from southern NSW and Victoria to Moree, and trucks were carting tonnage from the railhead to feedlots. This is supplementing tonnage being brought by road direct to the Darling Downs, and via ship into Brisbane. Little rain is forecast for the northwest plains of NSW from the system expected in Queensland next week. Shockingly dry conditions in the key wheat-producing regions of Narrabri, Moree and the Liverpool Plains are expected to thwart buying programs for flour millers and exporters. Darling Downs and southern NSW cottonseed prices have continued to creep up in the past week, with southern seed being trucked as far afield as feedlots on the Darling Downs. “We’ve never seen so much cottonseed get fed out by graziers, and the feedlots are at their full inclusion rate for it too,” one trader said. Australia’s biggest geographical concentration of gins is in the Gwydir and Lower Namoi valleys, and the trader said this higher production capacity meant supply in those regions was not as tight as supply out of Downs, Upper Namoi and Macquarie Valley gins. Farm Tender online broker, Dwain Duxson, says grain ex farm in Victoria and southern New South Wales was still trading at $280 per tonne or more on farm. Much of northern Victoria and southern NSW have had 10-40mm of rain in the past fortnight, enough to inspire hopes about spring grazing in some areas. “It’s getting to a point where some of the livestock people are finishing up feeding, and their pastures will start to get away in the next couple of weeks. Despite recent rain, and a softening in US futures values over the past week, a trader in southern NSW said domestic prices had not dipped. “There’s some potential for feed to grow on this rain, but we’re not seeing any dramatic change in prices or buying patterns yet. Trade sources said trade-held and on-farm barley was very hard to find. “People have stopped asking for it because they know it’s not there, and we’re not getting new inquiry now. 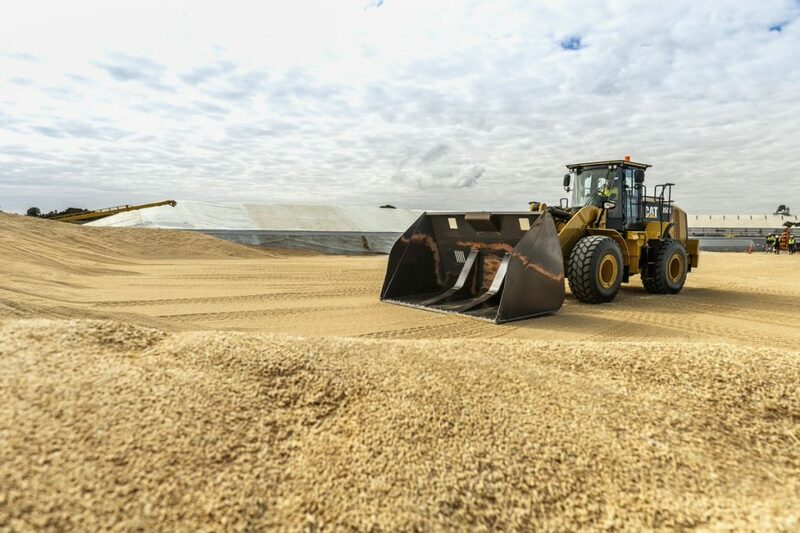 In South Australia, trade sources report very little unpriced grain is being held, with any parcels left likely to be in the hands of Viterra and Grainflow.